An educated workforce has long been a fundamental element of economic development. People with more education tend to earn higher wages, exhibit lower rates of unemployment, and substantially contribute to business recruitment and growth. However, it is also an indicator of economic health because adults with higher education levels are more likely to locate in places offering the most economic opportunity. In the Mountain Resources Commission (MRC) region, 81.3 percent of the population (25+ years old) currently has at least a high school-level education, up from only 74 percent a decade ago. Over the same decade, the percent of the population in the MRC region with at least a bachelor’s degree has increased by a quarter, from 16.8 percent in 2000 to 21 percent in 2010. More than 85 percent of the population (25+ years) in Buncombe, Henderson, Transylvania, and Watauga Counties has at least a high school-level education. 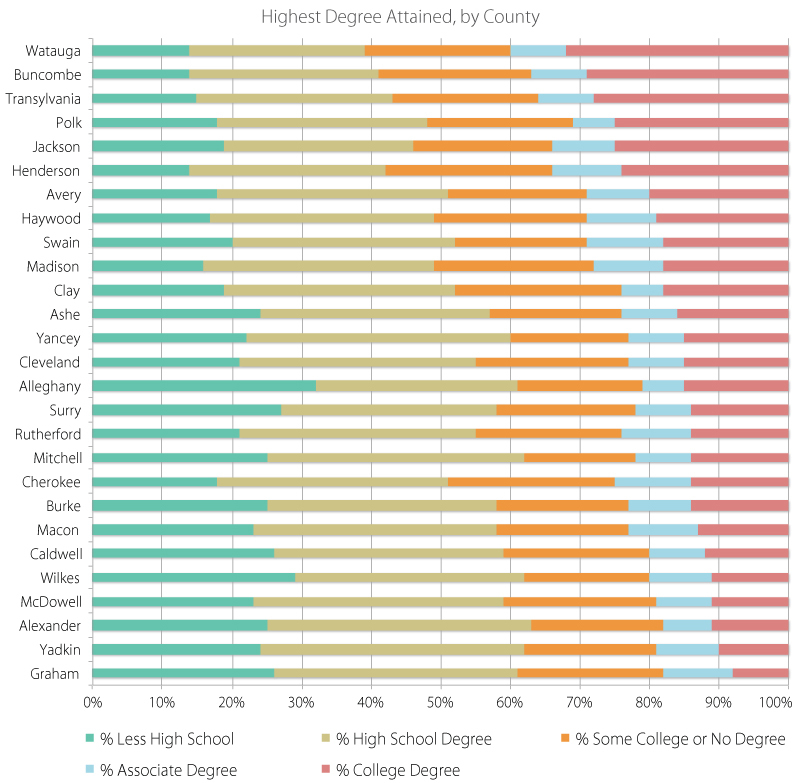 Over 30 percent of the population in Watauga County has at least a bachelor’s degree-level education, along with 25 percent or more of the population of Buncombe, Transylvania, Polk, and Jackson Counties. 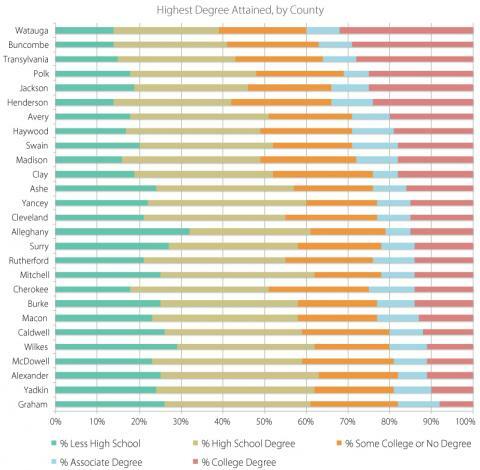 Only 10 percent of the population in Yadkin County and 8 percent in Graham County have a bachelor’s degree-level education.